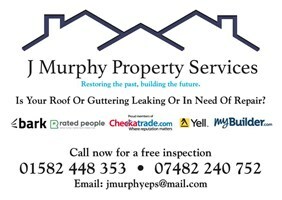 J Murphy Property Services - Roofer based in Gerrards Cross, Buckinghamshire. Welcome to J Murphy Property Services. We are a family run roofing company based in Dunstable and cover a large area as far as Northampton to Watford. Hertford to High Wycombe and all surrounding areas of North and West London and further afield upon request. We are your local, reputable roofing company, and proud to be. We have references that we have collected from many satisfied customers over the last 20 years. At J Murphy Property Services, we have been replacing and repairing roofs and guttering since 1997 for both home and business owners. All of our work is carried out by our family team with no need to hire subcontractors. We pride ourselves in working to the highest of standards using only the best quality roofing materials in today´s market. Moss removal and general roof cleaning. We only accept full payment once our customer Is completely happy with the finished Project. Our professional team keep up to date with the latest roofing technology to make sure we continue to always give our customers the best products and hassle free solutions to any roofing requirements. All of our roofing work is fully guaranteed, our company is fully insured and we have public liability insurance of £5m for your ease of mind. We offer a professional roofing service at an affordable price so give us a call today to arrange a free roof inspection and to discuss your roofing requirements with a member of our friendly team, call us on 01582 448 353.